Schedule an Educational Magic Show that is Kid Friendly and Filled with Fun! A 45-50 minute Educational Magic Show that is Kid Friendly and Filled with Fun. A Full Time Experienced School Assembly Expert who knows what schools need – along with his doctorate, Dr. Gary is a former Elementary AND Middle School Teacher who taught in Michigan, Georgia, and Tennessee. Educational Content that inspires students to use Higher Level Thinking Skills and Creative Problem Solving. Quality Magic by Tennessee’s Premier Magical Entertainer. Dr. Gary tackles the “Green Solution” with a magical twist and shows how to Clean Up Air Pollution! Watch as one of your students helps make a table float! Tons of age-appropriate Comedy that your Students will love! The exciting magical appearance of Dr. Flegal’s trained live birds! Dr. Flegal brings a powerful, high quality PA System to ensure that everyone can hear. Dr. Flegal can also be your “Artist-In-Residence” for the day, doing workshops for smaller groups of students after the assembly program(s), answering questions and teaching magic. Dr. Gary has the experience to inspire your students, just as he has each of the past 10 summers in the Franklin Special School District’s Young Scholars Institute where he teaches beginning and advanced magic. Schedule Gary Flegal For Your School! Fantastic Time with Dr. Gary!! 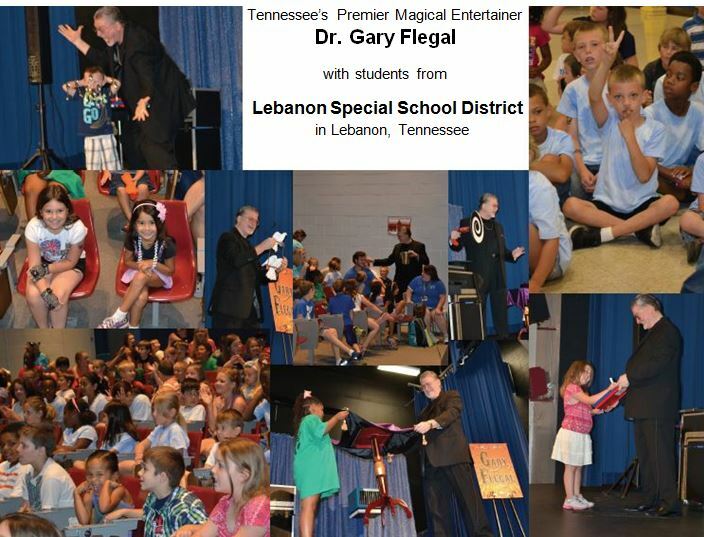 “Gary Flegal provided a fantastic show for our children in the Lebanon Special School District. We have children from Pre-K to 8th grade. They all loved the show and were amazed at everything he did. The children especially had fun when he came out into the audience and starting “pulling” coins from their heads and ears. He even got one of their teachers involved. – Dr Gary was great! The students loved his show for their 6th grade year-end party. He had them entertained from the beginning of the show until the end! Many students were able to be a part of his show and that made them happy. The teachers were very impressed with his interactions with the students and ability to keep them entertained. He was very accommodating to our schedule and flexible to our needs. He even stayed after his magic show to talk with the students and make some balloon animals. They were all very interested in talking with him afterwards. I would highly recommend Dr Gary for your next event! “This letter is written as an endorsement for and an expression of appreciation to Dr. Gary Flegal for the outstanding magic assembly which he provided for my school. From set-up to take-down the entire performance was smooth, professional, and extremely entertaining. More importantly, the assembly was highly educational as well. Gary stressed the importance of reading and studying to learn and instilled a genuine love of books. The individual sessions held with each class were informative, stimulating, and did much to enhance the earlier assembly program. “On behalf of the student body and staff, I send our thanks and appreciation to you, Dr. Flegal, for an excellent performance. It was fun-filled, fast moving, and most entertaining. We also appreciate the fact that you promoted reading. “We would highly recommend your program to other schools. Your performance was very professional and entertaining. Students and staff alike were fascinated with your magic and question how you accomplished it. “Thank you so very much for a wonderful assembly. “Dr. Gary Flegal’s school assembly program brought magic to our school, indeed! With the show’s dazzling outfits, feats of magic, and use of animals, all eyes were on him and students hung on his every word. “Thank you for your fine performance at Seahurst Elementary School. The PTA was a little reluctant, at first, to sponsor a magic show as their last experience with a different “magician” was not too successful. However, your show was perfect for our children and they responded well to your program – the magic was entertaining and enthralling for the children and even the parents and teachers came away from your performance with words of praise. 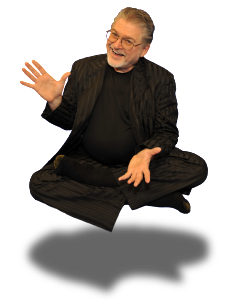 “I hope we will again have the pleasure of sponsoring The Magic of Dr. Gary Flegal at Seahurst Elementary School. It was certainly a pleasure working with you. “Thank you for making our day. It was exciting for me to watch and listen to my students and staff enjoy your outstanding program. Your ability to relate to everyone with your Magic makes your performance one I would endorse and recommend to others.